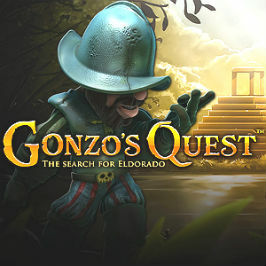 Gonzo's Quest is perhaps the most famous online video slot in the industry right now. Designed by NetEnt and paving the way for what all of today's video slots should be, the Gonzo's Quest slot is as much of a storybook adventure as an innovative prize machine. Indeed, if you stick with us for the next few minutes, our Gonzo's Quest slot review will tell you everything you need to know about this contemporary classic. From masterful animations to its unique win system, our Gonzo's Quest guide will break down the finer points of the industry's top spinner. 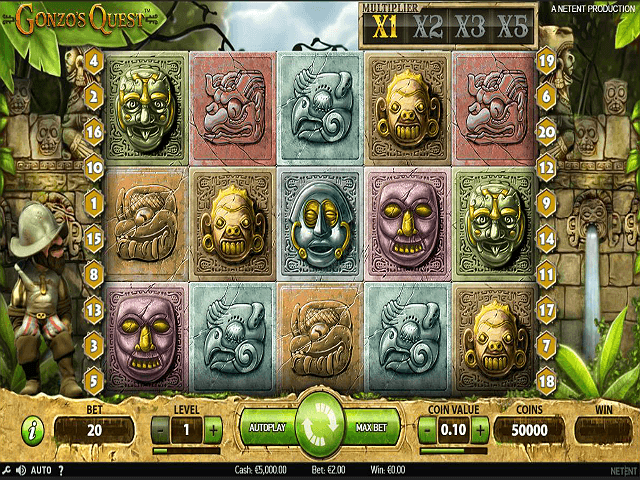 Play Gonzo’s Quest Slot Demo for Free! Play Gonzo’s Quest for Real Money! The year is 1541, the place is Peru and the mission is simple: find the lost city of El Dorado and all of its riches. 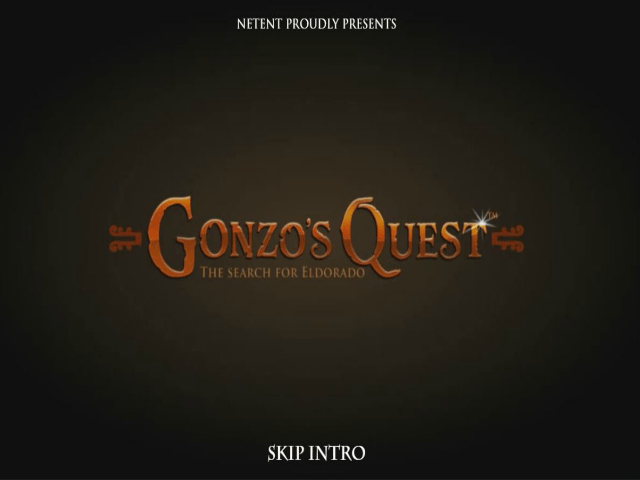 When you first load up the Gonzo's Quest online slot, you'll be greeted by a mini movie sequence that sets the tone for what's about to unfold. As well as being extremely high quality in terms of looks and production, the movie creates an instant sense of engagement with the main character (Gonzo) and the overall theme. By creating a subplot, the design team at NetEnt has actually given this video slot a purpose. In fact, this purpose (i.e. Gonzo searching for gold) carries over into the game itself. As you play, two things are present. Firstly, symbols are carved into stones that form a wall that's blocking our hero's path. Beyond the stones, the golden temple sits in the background and you catch a glimpse of it each time the blocks fall. This underlying story is part of the reason why Gonzo's Quest slot games are so popular. By giving you something to focus on, it creates a better sense of engagement and a desire to continue playing for longer. Coin Value = This is the cash amount you want to stake per line. This variable ranges from 0.01 to 0.50. 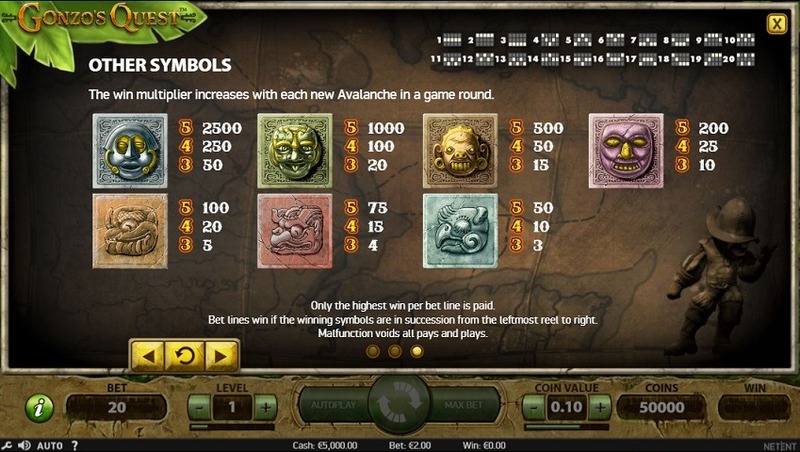 Level = This betting option ranges from one to five and relates to the number of coins you're staking per line. When you combine the above variables with 20 paylines, you'll get the total price per round, which, in real terms, can range from 0.20 to 50. Regardless of the stakes you're playing for, the payout table is based on multipliers, which means someone at the lowest level will win the same (relatively speaking) as someone placing a max bet. In terms of potential prizes, the smallest amount you'll collect is 3x your line bet, while the top win combination will release a 2,500x jackpot. 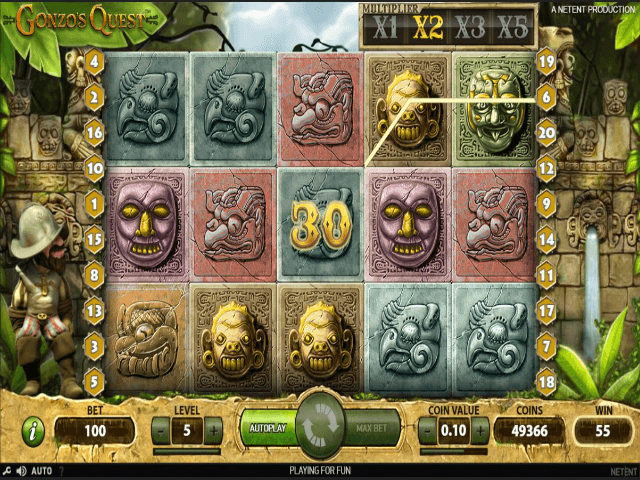 Aside from an engaging storyline and theme, the reason NetEnt's Gonzo's Quest slot game stands out is because of its Avalanche feature. Thanks to the falling symbols dynamic, you can set off a chain reaction of wins each time you hitting a matching combo. Put simply, each time three or more matching blocks produce a win, they'll then explode and be replaced by a new set of blocks. If these blocks create another winning combination, the process is repeated and this cycle will continue indefinitely. What's more, this feature is made especially lucrative thanks to the Avalanche Multiplier. For each win you hit, you'll receive an extra multiplier up to a maximum of 5x. What this means in reality is that you could hit a win streak, increase your multiplier to 5x and land the jackpot combination. This 2,500x win would then be multiplied by five to give you a whopping 12,500x return on your line bet. This innovative win system works perfectly with the overall theme of Gonzo's Quest and, when all is said and done, it's the reason players rate this as one of the top online slots in the world. Share this Gonzo’s Quest Review today! If you like Gonzo’s Quest, you'll love these pokie titles too!